← Are chemicals people too? Flame retardants. They’ve been in the news a bit lately, so you’ve probably heard of them. But maybe you haven’t. After all, there are so many chemicals in the news these days. Flame retardants (FR) have been used for several decades now to manufacture products that resist catching and spreading fire. Good uses for this are plastic casings on electronic devices and wiring that may actually spontaneously catch fire. Less good uses are our clothing, carpets, and furniture. Historically, I can see it not being a tremendously bad idea for household fabrics to contain FR – given that a lot of people smoked cigarettes in the home. Nonetheless, I’d say it’s still pretty much your own stupid fault if you let your smoking habit burn down your house. But when the flammability of synthetic fabrics came to the attention of the U.S. government, the Flammable Fabrics Act was born (1954) and fabrics that didn’t meet the grade began being coated with FR. 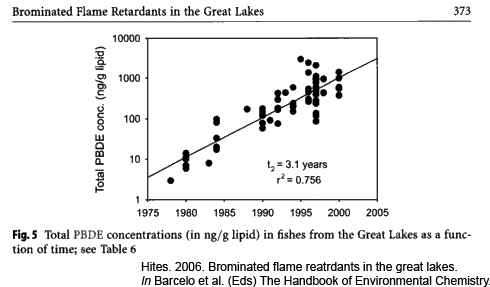 Brominated flame retardants (BFR) started being used during the 1970s. Prior to that, other chemicals were used to make things ‘fireproof’ – remember asbestos and PCBs? PCBs were banned in the U.S. (1978) when they were found to be toxic and started showing up in high concentrations all over the food web. That’s called bioaccumulation. Well, BFRs are the new PCBs. 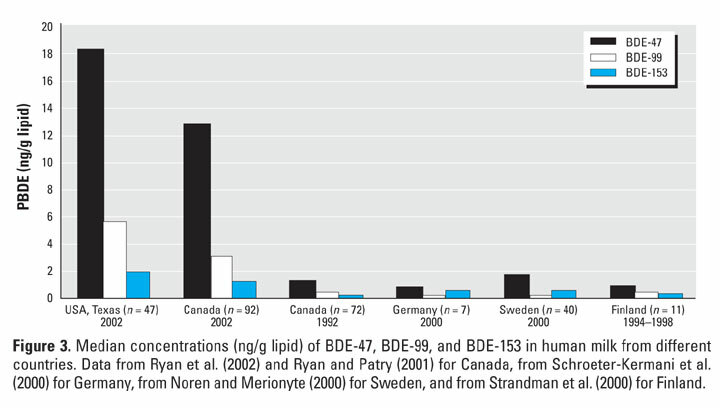 Structurally very similar to PCBs, it’s not a big surprise that they too bioaccumulate and are now found at high levels in things like breast milk (compare U.S. to other countries). How do FR end up in our bodies? The data aren’t in yet but studies have shown that BFR are in our food, in the air, and can be absorbed right through our skin. Here’s an interesting statistic for you: in 1980 there were about 300 deaths due to clothing igniting, compared with about 100 in the YR 2000. Does that reflect an increased use of FR in clothing or, say, a reduction in smoking? Another stat – the Bromine Science and Environment Foundation estimates that 280 lives/yr are saved by BFR for all fire-related deaths (4000/yr)…but at what cost? BFR are known mutagens, suspected carcinogens, and neurotoxins to boot – and we are all exposed to them, not just people who are afraid their clothing or couches are going to catch fire. This entry was posted in Rants, Scientific. Bookmark the permalink. Okay, so where are the fun graphics from? They are from Annie Leonard’s ‘Story of Stuff’ which you can download http://www.storyofstuff.org website. I did colour the hair of the first image. Thanks for reading! A sad but telling follow-up to this blog entry is a link to a Nat Geo story on Tasmanian devils found with cancers caused by fire retardants. I believe this is happening t our polar bears, too. So where can we get pillows and blankets without BFRs? Basically, you gotta go natural. 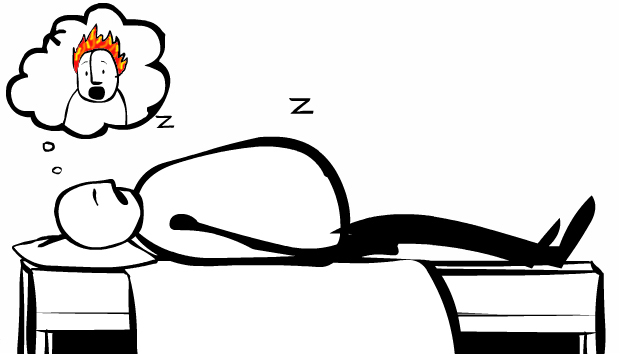 The reason most things these days are coated with flame retardants is that most things these days are made from poly-synthetics (polyester fabric, polyurethane foam, etc). That means they are plastics and melt. And the Great Good Government has decided that we can’t be trusted to make choices that include clothing and furniture that could melt so a law is born and enforced. Anyhow, by choosing non-synthetic materials (wool, cotton, hemp, etc) you can pretty much avoid those questionable BFRs.